Don't forget about the Broadband Communities Summit coming up in April. The weather should be optimal in Austin, Texas, for shaking off winter blahs. From April 30th - May 3rd, attendees will be learning all about FIBER: Putting Your Gigs To Work at the Renaissance Hotel; you can still make it if you register online. The agenda has developed nicely since we first told you about the event a month ago. View it here. On the afternoon of the first day, the Coalition for Local Internet Choice (CLIC) will be ready to present a special program, The Vital Role of Local Choice. Great nations are built on great cities and towns. Over the last few years, communities across America have come to realize that their ability to achieve greatness, or even success, in the years ahead will depend on their ability to acquire affordable access to fiber-rich communications networks. We will continue to help members of CLIC and our allies to be as effective as possible in opposing barriers to local Internet choice. Emphasizing the positive, we will showcase successful local initiatives reflecting the benefits of local control for the community’s economic and broadband future. We will discuss the factual and legal arguments that work best in refuting the new wave of objections to community broadband and public-private partnerships. And we will finish with a deep dive into the experience of a small rural community that furnishes – an excellent example of how the public and private sectors working together can build a great community and an inclusive and advanced workforce. Christopher will present at several panels, as part of the Economic Development Track Blue Ribbon Panel, which kicks off the economic development track on Tuesday, May 1st at 3.p.m. central time. He'll also be stepping in to other conversations to answer questions and propose them to some of the other experts on hand. To see what other experts in the field will be at the Summit, check out the list of speakers. Check out the agenda and register for the event. See you there! 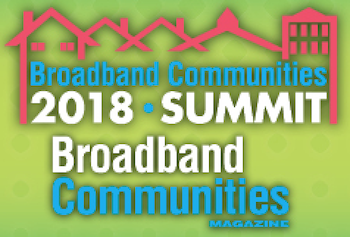 Broadband Communities Summit 2018 Next Week! Still Time To Register! One could say that the expansion of the Fire Department takes jobs away from undertakers, furniture salesmen and carpenters in Paducah, but most believe this to be a worthy trade off.